Communicate and collaborate in real time – directly, intuitively, and effectively. Gain real-time situational awareness through seamless integration with EHRs, medical devices, and other systems. Help reduce interruption fatigue. Scale from a single department to an entire integrated delivery network. Unify care teams, information, and priorities around the patient with a complete platform for clinical communication and workflow. Recognize and respond to a change in a patient’s status and collaborate with the entire care team quickly. View waveforms and vital signs from anywhere. Send and receive messages tagged with patient data and care team information. Seamlessly access calling and secure texting from within mobile EHR apps. And much more. There is no other communication solution I’m aware of that can send a notification as closely and instantly to a nurse than the Vocera system. Vocera Rounds is a powerful tool that provides a system-wide way to track patient feedback and recognize staff members. It was adopted quickly by leaders because it’s user friendly, and it really makes a difference, which ties to our outcomes. Physicians respond faster when using the Vocera secure texting app compared to traditional pagers. The integration of Vocera technology with our life-safety system is like having our own 911 center. 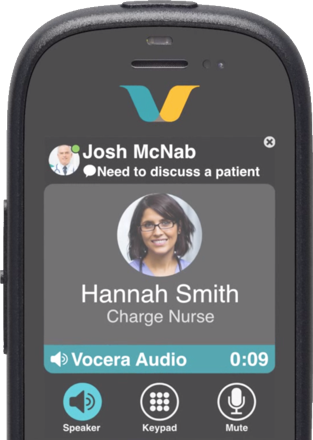 I use the Vocera smartphone app to securely connect to the care team. It enables us provide more efficient and responsive patient care. The Vocera numbers speak for themselves, and they show this technology can dramatically reduce the time it takes to connect with a colleague and get a response. Ready to learn more about how Vocera is transforming care delivery?